Burma (now known as Myanmar) is located in southern Asia. It also happens to be the home of some of the most uniquely decorative coins in the world. They have become the centerpiece of many crafts ranging from buttons to necklaces. Their peculiar shape and intricate designs make them a staple for coin collectors. 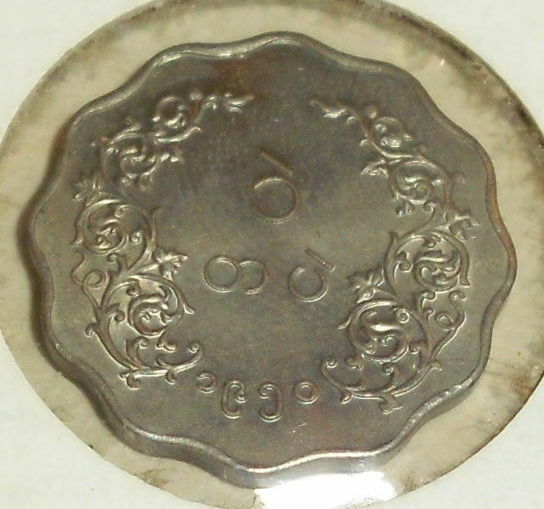 One particular coin has gained a great fondness of many collectors, the ‘1 pe.’ Although it was the lowest currency amount in Burma it still features a very sophisticated design. Measuring approximately 19 mm in diameter, this coin is not round, but it does have a circular shape called a scalloped design. The edges are wavy with 12 outer points 12 inner points. The edges are slightly raised from the rest of the coin. On the reverse of the coin, characters reading ‘1 pe’ are created with raised lettering. The date is below. A very detailed vine design accents the lettering. The design is also raised. The vines outline the edge of the coin, circle around the bottom, and fade away towards the top. 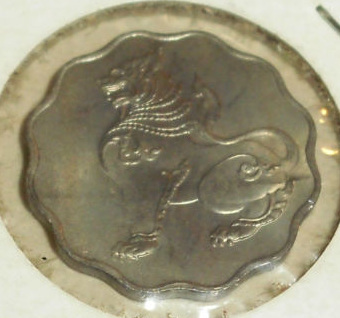 On the obverse of the coin sits a powerful lion with its head high. The mouth of the lion is open slightly, it’s ears are pointed, and its tail is erect. The front legs are straight and the back legs are bent. The lion itself is a very extravagant design that represents wealth and power. The rest of the obverse side is plain. There is no background which makes the lion the entire focus of this side of the coin. This coin is no longer in circulation, but is used throughout India and Thailand as offerings to temples, statues, and other religious items. It is collected by many and used by crafters in a variety of ways. Unlike many ‘collectable’ coins, 1 pe are actually avidly available and the value of the coin has not risen immensely. They are affordable and often times a high prize among beginning coin collectors.